I have to tell you after we shot this, I ate a million of these on set. They are so so good. Simple, and easy, and seriously perfect to make for a group of friends while you have a Harry Potter marathon. They are also cute and light and airy. There is a subtle kick in sauce which is awesome. This is a really great recipe to make when you entertain. 1. Pour oil in a large pot and begin preheating on medium-high heat. 2. Place all ingredients for the hush puppies into a large bowl and whisk together to create a thick batter. 3. Once the oil has reached 350 degrees F fry large (2 tablespoon) spoonfuls of batter for about 5 minutes. This will take several batches. 4. Drain on paper towels and season with salt and pepper. 5. In a small bowl combine the honey and chili sauce and stir together. 6. 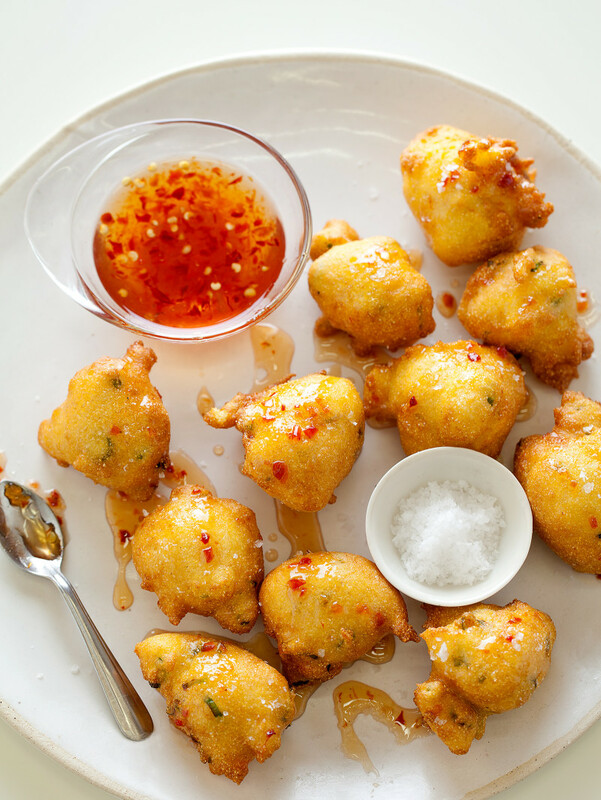 Serve the hush puppies warm with a drizzle of the spicy honey sauce. Oh yum! Funny: I make an eerily similar spicy honey “drizzle” (“dip”) as well. So much better than Thai Sweet Chili sauce. These are great appetizers. I ate them while on a vacation in Kenya, they are called as bhajia there. really good. These sound great! They would be a yummy and different app for a football viewing party! I’m keeping this one in mind! this looks like an awesome version of the southern classic… totally digging the spicy drizzle! Whoa, I’d probably eat 14 and save just 1 for whoever else was over for the Harry Potter marathon. Yum. Obviously I’m a little late to the party (as in almost a year late) but as a southern girl I love hush puppies and would never think to drizzle them in what looks to be an asian inspired sauce. With that being said…these look yummy! PINGBACK: 20 Best 20 | Friday Links We Love! Hush puppies are my favorite food group. Pinning!